Since I started running marathons, I’ve wanted to run in an inaugural race. 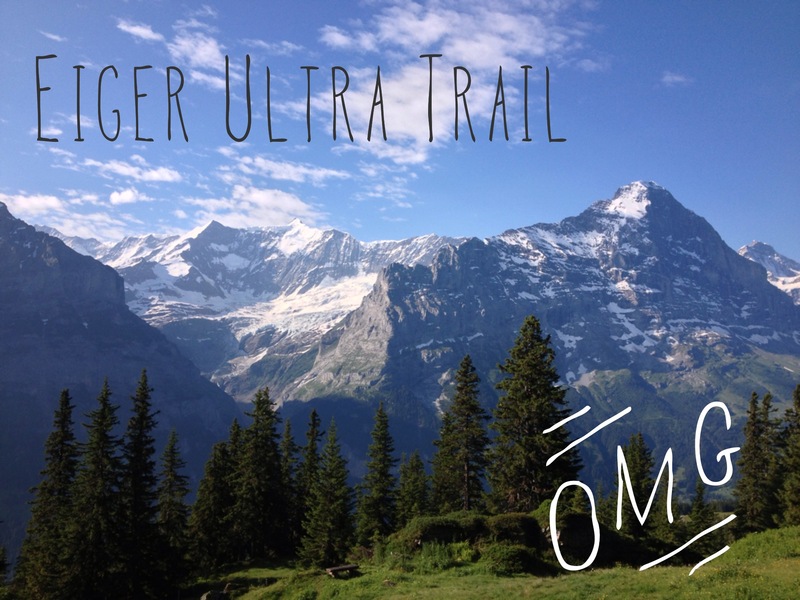 When I found out through my friend Mark that Grindelwald was putting together the EigerUltraTrail, I knew I wanted to do it and so I signed up for the 101km. 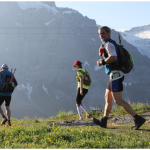 I had done the Swissalpine K78 a year earlier, been training on long distances and got in two mountain marathons (Graubünden & Zermatt) before the Eiger. 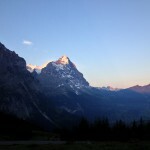 With comments like “you’re nuts,” “you’re crazy,” “what are you thinking” and such I was still excited to conquer the Bernese Oberland, so off I went to Grindelwald. I knew the race would be demanding with it’s 6700 meters of climb and descent. That was going to be the challenging part I thought. Distance takes time and endurance, mountains take strength. The course profile looks more like the graph of a heart rate monitor than a terrain profile. 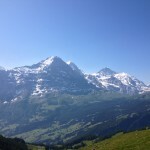 As I arrived in Grindelwald with my friend and running companion, AnneMarie, I was reminded of the spectacular beauty of the area, which I tend to see from the Kleine Scheidegg and not from Grindelwald itself. A brief, yet heavy downpour early on Friday evening reminded everyone how quickly a beautiful day can change in the mountains. After having our bags and gear checked we were given our numbers and officially registered as runners. After dining on a quick plate of penne with tomato sauce and having an alcohol free beer it was time for the important pre-race meeting and then off to bed. I slept surprisingly well and was up at 3:45 to get ready to head for the start. 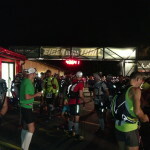 At the start line, we dropped off our bags and then had a chance to drink some electrolytes before starting. 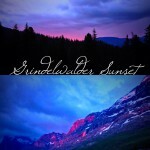 As daylight started ascend over the Eastern horizon at the Grosse Scheidegg the sky turned from a black blue to hues of indigo. The starting shot was fired at exactly 5am and we were off. 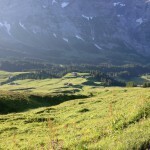 Through the end of Grindwlwald and towards the Wetterhorn. 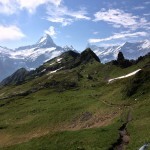 We ran through small forested areas and through idyllic fields at the foot of the Wetterhorn before encountering out first climb. 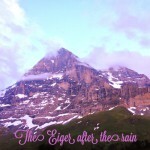 Steep up along the remains of a dying glacier we climbed towards the Grosse Scheidegg as the Peak of the Eiger behind us started to glow a peachy orange. The air was cool, the paths were dry and our hopes were high. 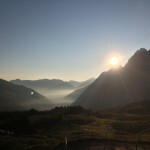 Arriving at the Grosse Scheidegg we were able to eat and drink, and passing the restaurant the sun greeted us beaming over a see of morning fog in its golden radiance. 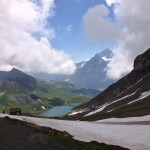 From the Grosse Scheidegg there was some nice comfortable mountain road running with a constant climb but nothing too bad. 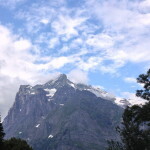 The next stop was the First, a place that at the beginning of June was still closed because there was too much snow still. Everyone on the 101 would see the first one more time. 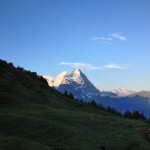 From First we ran down to Bort, which was the first taste of the descents to come, but our legs were fresh. Passing through Bort, I really felt that the refreshments were excellently placed. I had topped my water off at First and still had water with me. From Bort the route went back up to First. 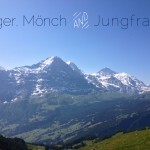 This is simply stunning coming around the turns and seeing Eiger, Mönch and Jungfrau from this angle. The sun was starting to beat down on us, but the air was still cool, so it was actually quite comfortable. At Bussalp we were again able to get refreshments and I topped my water off for the third time already and a good thing too, because the next three kilometers to the Faulhorn were tough. From way down I could hear announcements of people coming through that station. 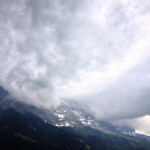 The clouds had rolled in around the Faulhorn and I was under the impression that rain may be on its way. I pushed myself up and got to the top where I enjoyed two cups of broth and some chocolate. The next stop would be in 11 kilometers. 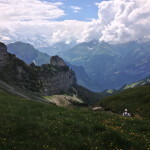 Making our way from the Faulhorn down and over to Schynige Platte was an adventure in downhill technical trail running. 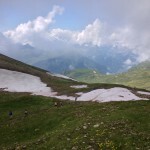 Several snow fields showed that winter had just recently left the mountains. I was wearing my On Cloudrunners and while I did not have any issues crossing the snow, it was the wet slate that occasionally caused me to slip a little and need to catch my balance. 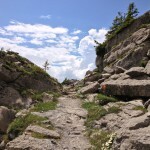 From my experience here, I would definitely recommend a technical trail shoe. 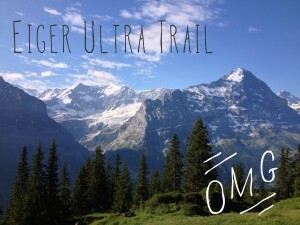 The EigerUltraTrail is not a classic mountain marathon, but one which pushes the limits of where you can run. 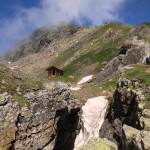 The way to Schynige Platte was long, the longest 11 kilometers of my life I thought. 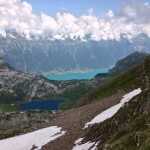 I hadn’t topped off on water at Faulhorn and five kilometers after I was out of water. Expecting Schynige Platte around every corner, I was never worried, but merely disappointed ever corner brought more trail. 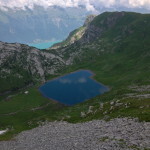 The views were breathtaking though with the Brienzersee beautifully turquoise below, it was almost surreal. At Schynige Platte I was able to pause for a few minutes, rehydrate and take in some calories. 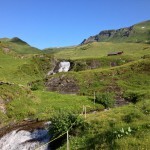 The next stop was 8.5 kilometers away and at the bottom of the valley — Burglauenen. Thinking that it would be all downhill I was quite enthusiastic. Hitting the steep wall where only narrow trails meander down the cliff, I thought I’d be down in an hour. 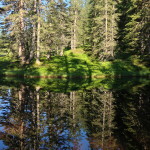 However, every so often the trails would force us up again and through the woods. The wind started to pick up and my biggest fear was being stuck on the wall when a thunderstorm rolled in. However, it remained sunny. Running past a pasture that had at least a 45 degree pitch it was amazing to see how the farmers still cut the grass and hand bale it. I had to dodge a farmer carrying a bale three times his size on his head. There was almost no space for us on this narrow path, thankfully I could duck and he leaned into the mountain. When I arrived at Burglauenen I was thrilled to have 52km behind me. Oranges and a plate of pasta with some time to sit was what I needed to tackle the remaining 49 kilometers. 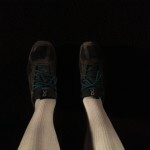 Some of the runners also changed clothing and gear hear, though I was content to stay in what I had. I was soaking wet with sweat, but otherwise I felt fine. The doctors were checking people to make sure that no one was putting themselves at unnecessary risk. I got the OK, but based on the number of people who stopped here, I would say that the course took its toll on some runners in the first half. 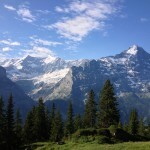 The path up to Wengen was anything but what I expected from having done the Jungfrau Marathon three times. We went seemingly up Itramenberg and again I was on a wall, where one wrong step could mean your life. 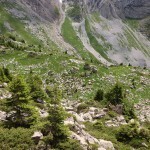 I was pushing up this mountain and passing numerous runners on the way. A few streams that needed to be crossed again made me question my choice of footwear, but they held and everything went well. Arriving up top to the sound of cowbells, the sky turned black. 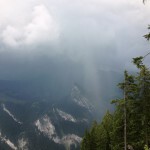 Within 15 minutes of running along an alpine road thunder rumbled in the distance as lightening cracked through the sky and the rain, which started as a few fat drops suddenly came in a deluge. 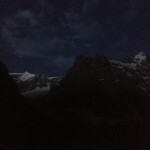 The next stop was Wengen, which AnneMarie and I ran too and reached just as the 7 o’clock bells started to ring — 2 hours before the cut off. 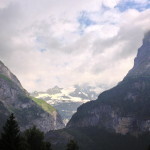 In Wengen we were told that there is a pause in the race until the storm let up. 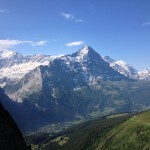 The stretch from Wengen up to Männlichen was in the end dropped and we took the gondola up where we could refresh. Time for rain coats and long pants. 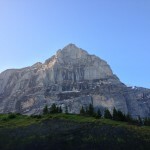 The officials up top then notified us that for safety reasons the path over the Lauberhorn and Eiger Gletscher as well as the Eiger Trail would be dropped in favour of an alternate more direct route that would go over Kleine Scheidegg and then down to Alpiglen along the service road. 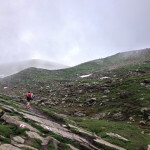 At this point I was relieved, because I wanted to finish the race, but having done 61KM of the most difficult and technical trail running in my life, and knowing the dangers of the mountains when the weather turns, I was nervous. My hat goes off the the organizing committee for the swift and decisive resolution. For future events, I think letting runners know what the Plan B route is and notifying them via SMS would be a way of eliminating some of the minor confusion and responding even faster. 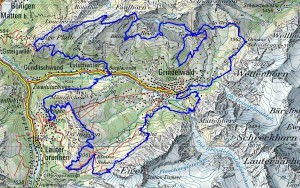 The last stretch from Brandegg up to Pfingsten was the most brutal. Looking at it from the distance, AnneMarie and I swore that it had to be much higher than the 400 meters claimed in the material. Running in the dark also adds another element, especially since the trail is still quite steep and technical and you’re forced to watch your feet, stay on trail and go up. Again here I ran out of water and made it up to Pfingsten light headed and with a parched mouth. I took a few minutes to breathe, drink plenty of fluids, fill up on water and eat something. 6km to the finish and I feared more narrow trails as my thighs were really sore. I had used a pole only for about 2 kilometers and admit that it makes a big difference. Fortunately the way down was a service road and we were desperate to get in under 20 hours. AnneMarie convinced me to run it as the pain hurt less when you go fast. It helped us finish faster and for that I’m thankful. On the flat and small climb into Grindelwald my adrenaline kicked in and I thought I was flying (not sure if this was the case as I also thought that 400 meters was more like 800), but I was definitely moving faster than other runners and AnneMarie and I passed a few as we ran the last two kilometers. We crossed the finish line 19 hours and 40 minutes after we set out in the morning. 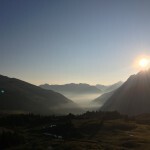 Despite the occasional cursing of the organizer for planning one of the hardest runs in the world, I am glad that I was there to do it. Knowing now exactly how technical the trail is, I have a new appreciation for trail shoes and what true trail running can really be. The organization was well done, and showed its true competency when the weather turned. For my part two days after the event, I can honestly say that I look forward to completing the route as it’s meant to be run next year. 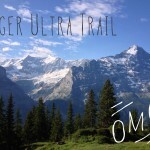 This entry was posted in Berner Oberland, Eiger, Eiger Ultra Trail E101, Grindelwald, Mountain Running, Race Report, Switzerland, Uncategorized and tagged Bern, Berner Oberland, Eiger, Eiger Trail, Eiger Ultra Trail 101, Grindelwald, Schynige Platte, Scott Trail Running, Switzerland, Trail Running Switzerland, Wengen by Christian Langenegger. Bookmark the permalink. Congratulations on finishing. Nice race report Christian. 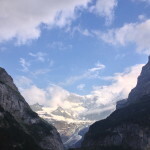 You were more fortunate than I. I was made to turn around and run back down to Wengen after climbing three quarters of the way to Mannlichen. I managed to finish in 19 hours 21 minutes. 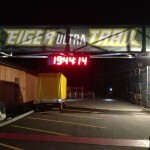 The organizers knocked off an hour to compensate for the extra time lost which made my official finishing time 18:21. But, I would rather have done the race as originally planned. That’s a brilliant time. Congratulations. Yes, next year we’ll get to run the full course. 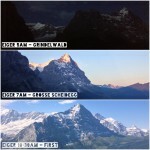 I would still like to see what the “new” distance was for people stopped in Wengen. Great race report. I ran the 51k and after reading your report i cant wait to run the 101k.